Essanay’s Gilbert M. Anderson had stolen Charlie Chaplin away from Keystone with an offer of $1,250 ($29,000 in 2015) a week-a princely sum-and promises of a $10,000 ($236,000) signing bonus. The world has Chaplinitis…Any form of expressing Chaplin is what the public wants…Once in every century or so a man is born who is able to color and influence the world…a little Englishman, quiet, unassuming, but surcharged with dynamite is flinching the world right now. 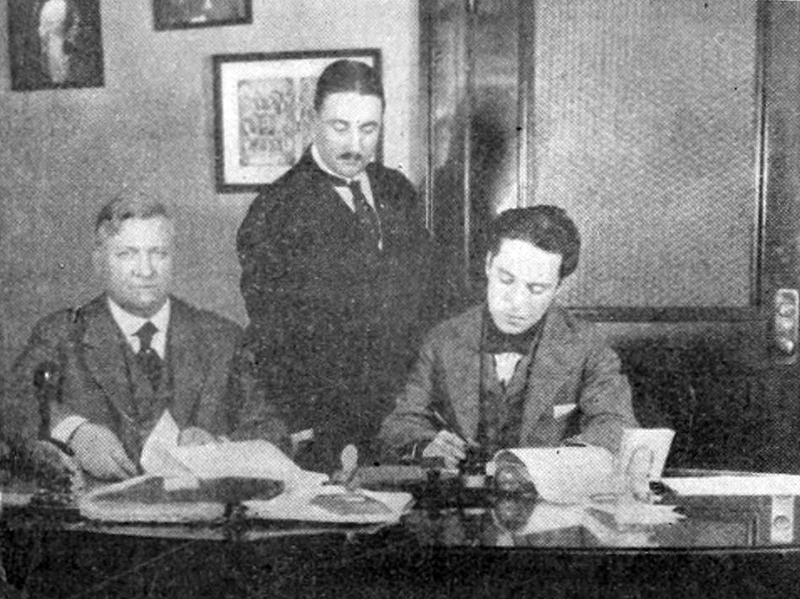 In January 1916, as Charlie Chaplin’s Essanay contract came up for renewal, Anderson told his partner that their comic star wanted $10,000 ($236,000) a week. Spoor refused to meet his demand, and Chaplin jumped ship for the Mutual Film studio-where he got his weekly salary as well as a $150,000 ($3,500,000) bonus. Moving Pictures World handled the two signings quite differently as Chaplain’s popularity gained. 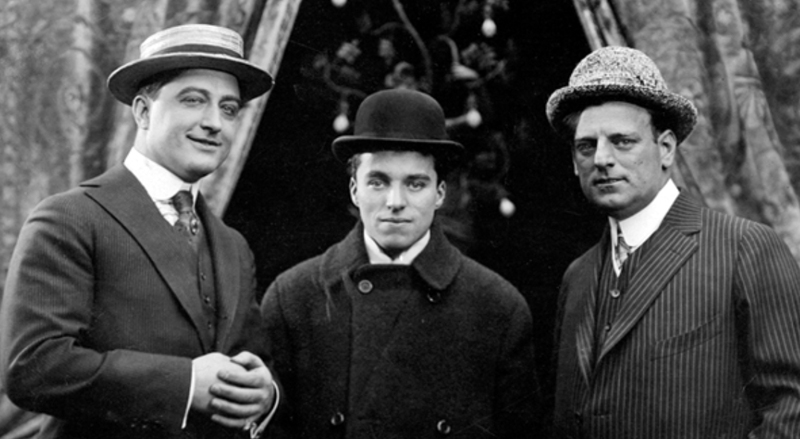 Three of the early stars in Chicago (from left): Francis X. Bushman, Charlie Chaplin, and G. M. Anderson. George K. Spoor Authorizes the Announcement That G. M. Anderson Has Signature of Famous Comedian. THE announcement was made in New York on Monday evening, Dec. 14. by George K. Spoor, president of the Essanay Film Manufacturing Company, that Charles Chaplin, famous screen comedian, had signed with his company. The information was contained in a telegram from G. M. Anderson from Niles, Cal. Mr. Chaplin in a remarkably short time has created for himself a unique position in the film world. He is a man who seldom gives one an opportunity to laugh with him: at the same time he gives occasion aplenty to laugh at him. The name of the director under whom he will work has not been announced, but it is assumed that he will be under the general direction of Mr. Anderson at the Niles studio, situated near San Francisco. *Triple Trouble is a two-reel silent comedy film that was released in 1918. 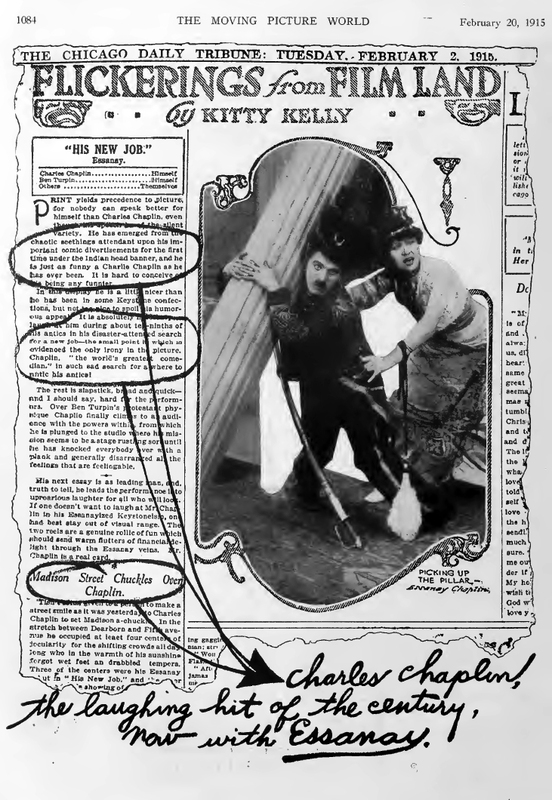 This film was not an official Chaplin film, even though it has many Chaplin directed scenes; it was edited together out of outtakes and newly shot footage by the Essanay Film Manufacturing Company, with Leo White as director for the new scenes. 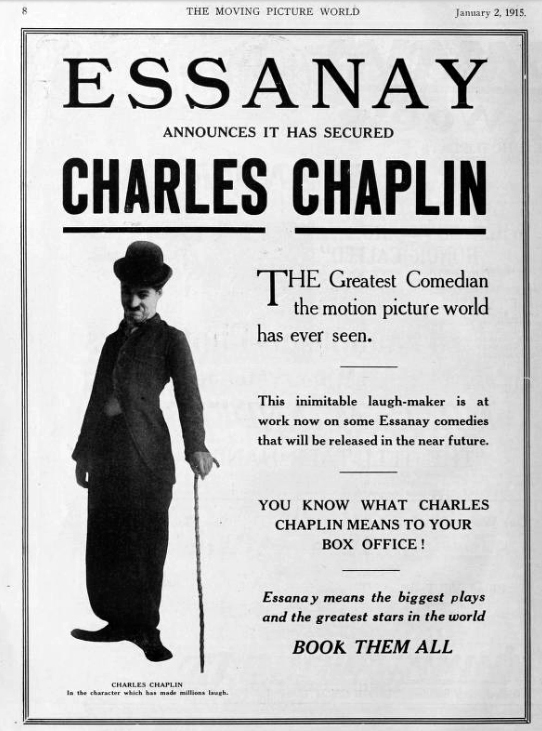 Since Chaplin did not have legal control over the films made during his time with Essanay, he could not prevent its release. President John R. Freuler Contracts to Pay the Comedian a Total of $670,000 for One Year’s Work. 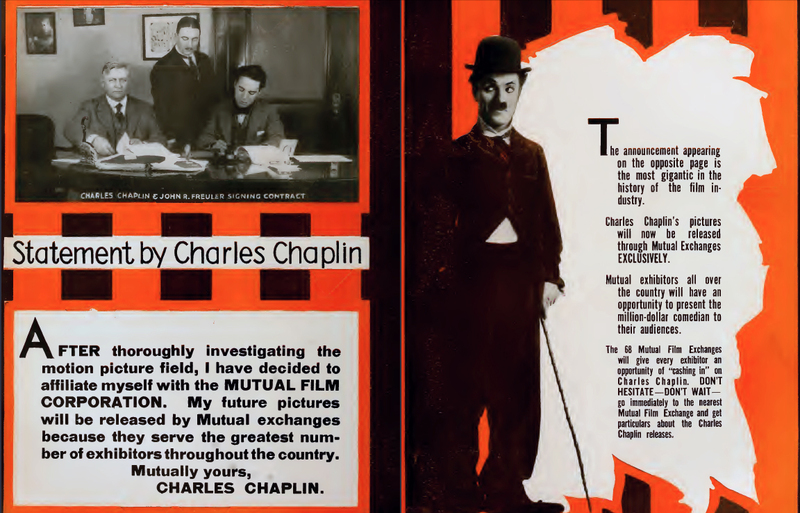 CHARLES CHAPLIN, not yet twenty-seven years old, on Saturday, Feb. 26, signed an agreement to play for one year in pictures to be released on the Mutual program. He will direct his own subjects and will make two reels each month. A company has been formed to take charge of the Chaplin productions. This company will pay Chaplin a salary of $10,000 a week. For signing the contract the comedian was given a bonus of $150,000. Which means, of course, $520,000 plus $150,000—$670,000. It would seem that never in the history of the stage and its related arts has there been a salary of tjiis magnitude. What makes the story doubly interesting is the fact that in the figures named there is every reason to believe the usual rather than unusual multiplication of the actu.ility has been omitted. Chaplin will have no financial interest in the output of his company. He can devote his whole attention to the making of pictures, draw his salary every Saturday and pass on the business stuff to the other fellow. President John R. Freuler, when seen on Monday following the signing of the twenty-thousand-word contract, did not seem to fear any occasion for worry on the Chaplin end during the coming year. In fact, he was in high good humor and neglected a pile of work on his desk to tell the World man how it all happened. “The negotiations for the employment of Mr. Chaplin really began last July,” said President Freuler. “You may remember that at that time there was prevalent an impression that the comedian was working under a_ six months’ contract. I asked Mr. Hutchinson, the president of the American, who was near Los Angeles, if he would look into the matter. Mr. Hutchinson reported that the contract with the Essanay company ran until Jan. 1 and we dropped everything. Personally I am opposed to disturbing players under contract. “When Sid Chaplin came east several weeks ago we had interviews with him. Then when Charles Chaplin arrived we went into the whole question seriously. I kept posted on what was going on. Everything was legitimate and above board. You may be sure when I read the rumors and saw Mutual not mentioned I was amused, because we were closer to the proposition than any of the others. Charles Chaplin was ambitious to have his own company. We did not care whether he had his own company or played in one of our existing concerns, so there was no argument on that score. “During the negotiations I had figured out the financial side and saw in a Chaplin engagement a handsome profit for the Mutual and especially for the producing company that is going to take care of the Chaplin pictures. No, the comedian will have no percentage interest in his own subjects. We are willing to have it the way it is. Sid Chaplin carried on most of the negotiations for the Chaplin side. Yes, he is a good business man. Asked as to the location of the studio in Los Angeles at which Chaplin would work, Mr. Freuler said two sites were now under consideration. He said his new star would be in New York perhaps a week longer winding up a few remaining formalities, among which would be the signing of documents having to do with life insurance. Mr. Freuler is taking out a policy on his new comedian aggregating a quarter of a million dollars. 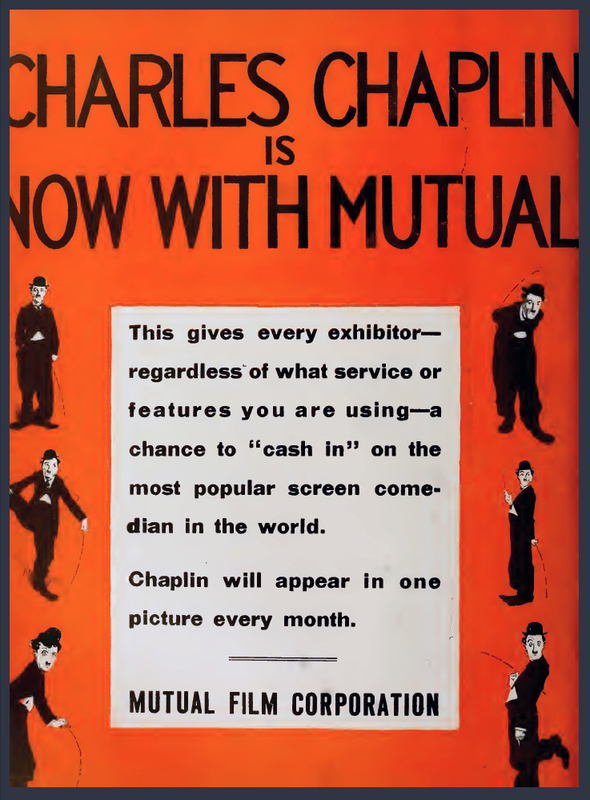 The Mutual’s president said that up to that time Sid Chaplin had no connection with the Mutual—that so far as he knew the business future of the little comedian’s brother had not been definitely settled. “It means that I am left free to be just as funny as I dare, to do the best work that is in me and to spend my energies on the thing that the people want,” said Mr. Chaplin shortly after becoming a Mutual player. “I have felt for a long time that this would be my big year and this contract gives me my opportunity. There is inspiration in it. I am like an author with a big publisher to give him circulation.